I have a confession: Back in the late 1970’s I was living in Allentown, PA and for a time worked at a department store where—this is so embarrassing—I dressed up as a seven-foot robot (named Orbit!) built around a motorized wheelchair. My job was to roam the toy department in hopes of getting the shoppers to purchase some of the outer space-themed crap on display. Where should we even begin with this review of Star Wars: The Force Awakens? Maybe a few paragraphs supplying context so you’ll understand my reaction. I went with very, very low expectations. I loved the first Star Wars—or, as it’s now called, A New Hope. That first episode was a throwback to those old swashbuckling B-movies from the 1940’s and creator/director George Lucas proved to be, above all, a terrific showman … every moment of New Hope was filled with neat effects and/or feats of derring-do. And while I also enjoyed the 1980 sequel The Empire Strikes Back, I’ll admit that by 1983 I was happy Return of the Jedi would be the end since the whole thing had clearly run it’s course. We shoulda been so lucky, right? What started out as Saturday—matinee escapism grew into an Important Cultural Milestone and pretty soon Bill Moyers was interviewing Joseph Campbell about the film’s archetypes and Lucas was promising six more and it was impossible to have a conversation with a straight guy under 30 that didn’t, at some point, include at least one Star Wars reference. Anyhoots—The Phantom Menace and it’s two follow-ups, Attack of the Clones and Revenge of the Sith, turned out to be not the sequels for which people had been waiting. Lucas got lost in the cosmology of his imagined world—warring political factions and internecine party squabbles—and gave himself over to all the technology that Industrial Light & Magic had been dreaming up. There were huge sections of the movies when the screen showed nothing but one CGI army fighting another one … it was like watching Adobe Photoshop battle Microsoft Excel. The first three (pardon me, Episodes I, II and III) came and went and fanboys the world over had jumped on the Lord of the Rings bus instead. The announcement last year that J.J. Abrams would be directing and co-writing Episode VII was met with some trepidation. Though Abrams had breathed life into the Star Trek franchise with his 2009 reboot, he stumbled with the 2013 sequel Into the Darkness. There was also a sense that maybe the zeitgeist had moved beyond the Star Wars world. But with an insane level of secrecy and security, Abrams and company went to work. Which brings us to this year and the marketing onslaught. You couldn’t go on the net, leave your house or watch television without Star Wars ads being rammed down your throat—I knew we were in trouble when, over the summer, my local Rite-Aid put up a display for cosmetics inspired by The Force Awakens. Make-up! What the hell? And so that was my frame of mind when I made my way to the theater. By now you of course know that the movie has broken every box office record in the history of film … even adjusting for inflation. Not only were the weekend numbers record–shattering, Force’s force continued into the week with the highest Monday box office grosses since the beginning of time. Not that it probably matters much but, all things considered, I actually enjoyed it. Whatever the downsides, are there are a few, Abrams can be credited with bringing humanity back to the series. While there is certainly no shortage of computer effects, they are a means to tell the story. (Unlike in Phantom, Clones and Sith when they replaced the story.) Abrams and cowriters Lawrence Kasdan and Michael Arndt have created compelling principal characters and following their journeys through the film turns out to be quite entertaining. Force Awakens takes place 30 years after the end of Return of the Jedi and introduces us to the troika of characters who will be our focus for this film and the two still to come (a.k.a. Episodes VIII and IX … oy.) Daisy Ridley plays Rey, a young woman who lives as a scavenger on the planet Jakku, waiting for the return of whoever dumped her there when she was a little girl. She’s a mechanical genius who can fix and fly any machine she’s put in front of. She meets up with Finn, played by John Boyega … he was a storm trooper but horrified by the actions of his evil overlords is now on the lam. He was assisted in his escape by Oscar Isaac as Poe Dameron, a seat-of-the-pants fighter pilot with the Resistance. How these three interact is the engine that makes Force move along at a welcome brisk pace. A few old friends show up as well. Carrie Fisher and Harrison Ford—Princess Leia and Han Solo—are back, as well as Chewbacca and C3PO. There’s also a new villain, his name is Kylo Ren and he’s played by Adam Driver. What’s up with them, and what’s happened to all of them in the past 30 years, are a few of the surprises in store—and I’m not about to give anything away. Although if you’re interested, I’m sure you’ll find millions of fanboys on the net debating the meaning and matter of this installment. Because yes, the fanboys … at least some of them … are up in arms! As much as I enjoy New Hope, Empire and Jedi there’s no denying that the world Lucas imagined was very white and very male. But with Force our three leads are a woman, a man born in Guatemala (Isaac) and a black man from Britain (Boyega.) This has greatly upset some of the rabid fans but I salute Abrams and company for creating a world out there reflecting the one right here. Of course, not everything’s coming up roses. I think one of the reasons I enjoyed Force so much is because it’s so … how do I put this? … familiar. It almost feels as if the writers have taken the most enjoyable parts of IV, V and VI, tweaked them a little bit and Hey, Presto! I don’t want to get into the specifics but many of the plot beats and characters seem lifted from the earlier movies—in a very real way The Force Awakens is like Star Wars: The Greatest Hits. 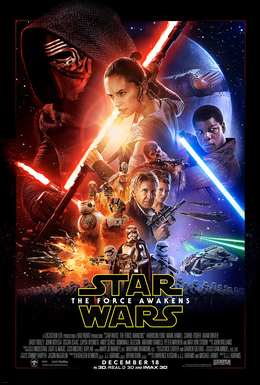 Star Wars Poster courtesy of Walt Disney Studios, IMP Awards, and Wikipedia.